When die-hard car fans get bored with the 4×4 rush out of their SUV, they simply shift to the 6×6 for an eye-popping response. You must be guessing on the Mercedes G63 AMG 6×6 but things are a way more different than imagination. 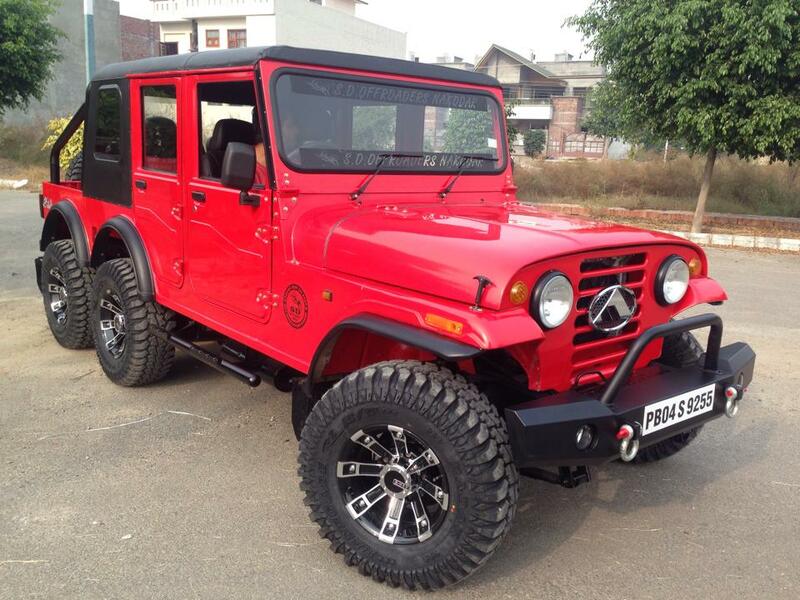 Here is a Thar 6×6 by SD Offroaders from Nakodar, Punjab. 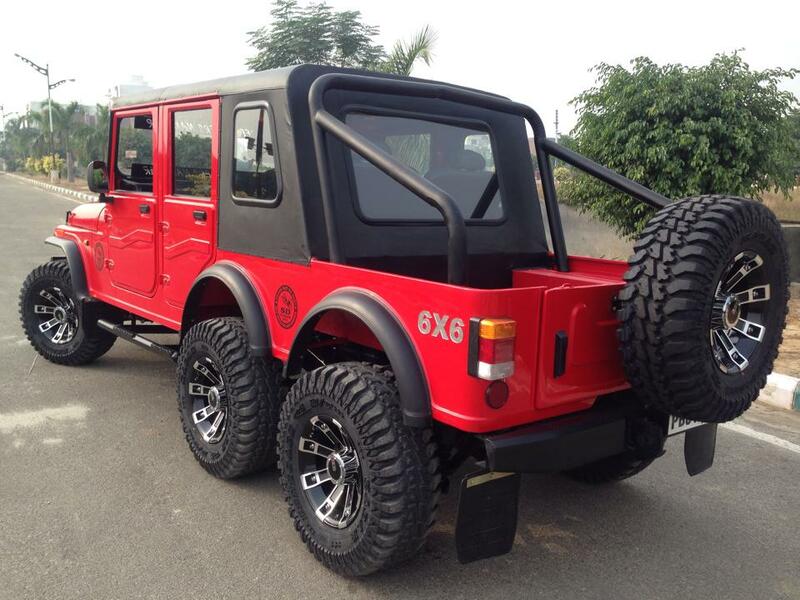 Mahindra Thar is one among the top modification friendly cars of India but putting in an extra axle with extended body makes it the most insane example ever seen on road. It feels more than just extended and will turn every visible head on the road for sure with its beastly appearance and powerful presence. 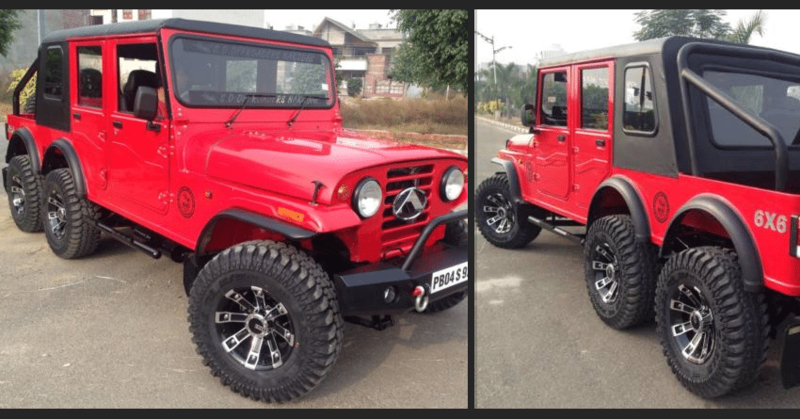 SD Offroaders have added an extra axle behind the rear wheels and all six ends now come loaded with Black/Chrome alloy wheels and massive all-terrain tyres. A seventh fully ready wheel is also mounted as a spare on the rear door. The deep treads of these tyres promise good control and grippy off-road adventure. The extended interior now comes with cabin crew style seating with an abundance of legroom for the second-row seats. 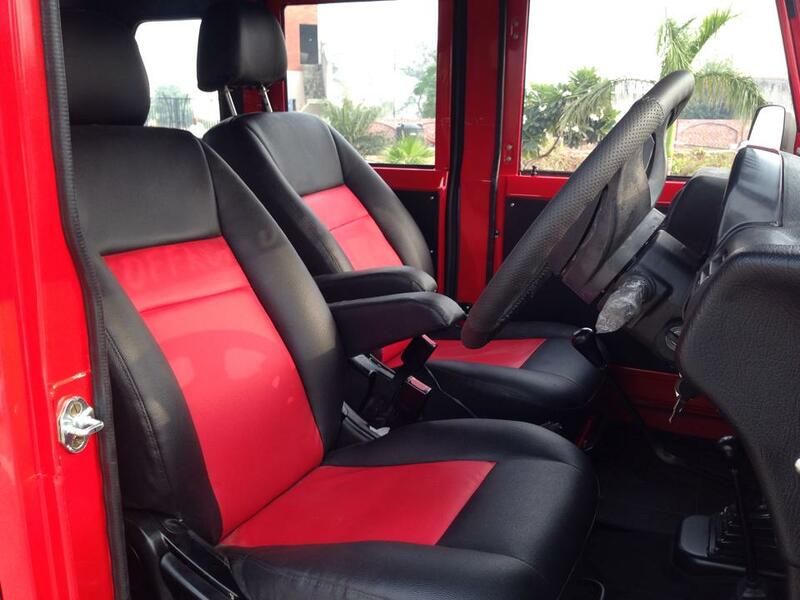 The amount of space can put some well-sized sedans to shame in the first look of this Black/Red interior theme. 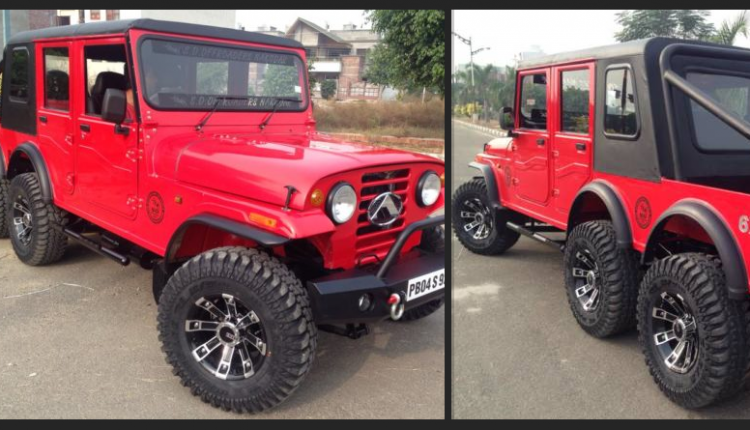 Front fascia on this Mahindra Thar 6×6 gets standard round headlights and a metal bumper with integrated bull bar. Rear exposes open-able door for boot loading while side view offers Bolero style rear doors with the most negligible design lines. 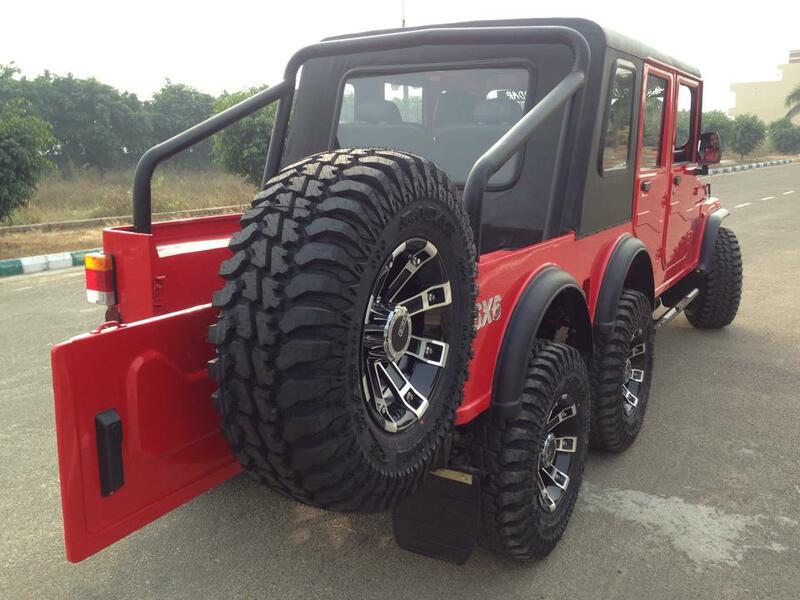 Mahindra Thar is offered with two different engine options in India. The top spec car is powered by a 2498cc, four-cylinder engine producing 105 BHP and 247 NM of torque. 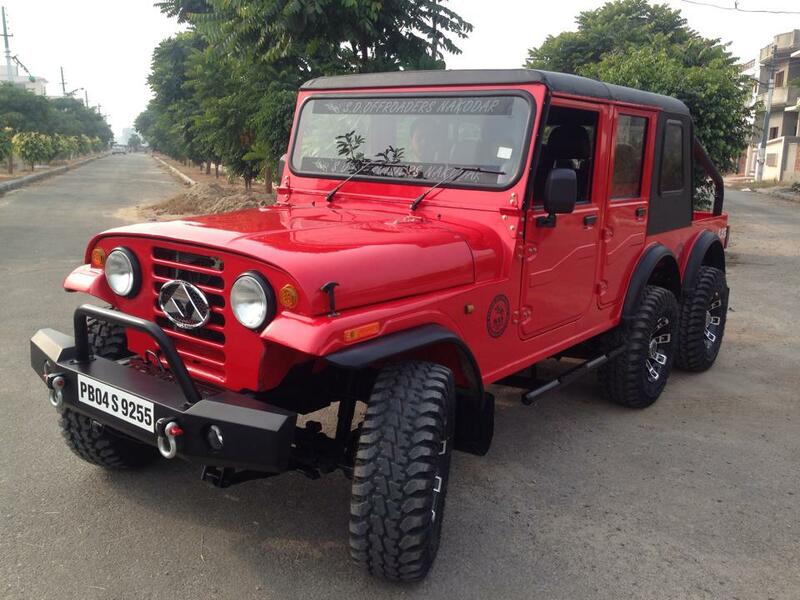 On the other hand, the 2523cc, M2DiCR engine on the Thar is good for 63 BHP and 195 NM of torque. Both options have a low reduction gear option on their 5-speed gearbox. I don’t think this is a that body as the wheelbase is much longer than that of the that I guess it’s derived from Mahindra commander or Marshal yet it’s worth to say nice work guys. Thumps up and a grand salute for your work.